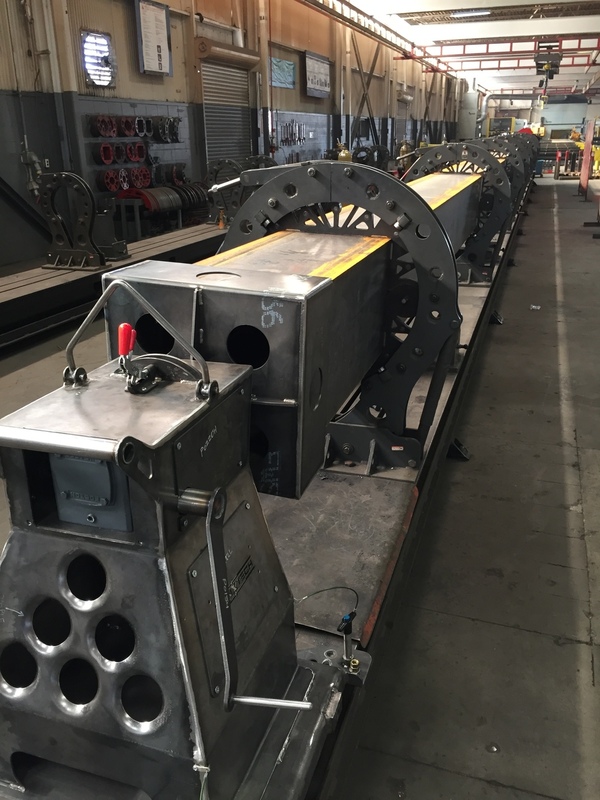 Column Rotator — Hester Fabrication, Inc. Problem: A structural steel fabricator was having a hard time rotating heavy steel columns in their fabrication fixture. They asked Hester Fabrication if we could design system to increase production rate while decreasing their safety exposure. Why Hester Fabrication: Being able to free up their internal engineering department and hand off the problem to a steam that could provide a turn-key solution was why Conxtech chose us to solve this problem. While solutions to problems like this would normally mean a business would have to work with separate engineering and fabrication companies, choosing Hester Fabrication meant that they could get both in one place. This results in savings of time and money. Solution: Hester Fabrication designed and built a portable cart that traveled along their existing fabrication table to the ends of the columns. An attachment mechanism grabs the end of the column so that an operator can then use the hand crank to rotate the column with ease. The result was a reduction in welder fatigue and a safer work environment.